The Internet, since its debut in 1989, has revolutionized commerce, communication, military action, and governance. Much of the modern world is simply inconceivable without it. This revolution, however, has not come without a price. The annual cost of cybercrime has now climbed to more than $1 trillion, while coordinated cyberattacks have crippled Estonia, Georgia, and Kyrgyzstan and compromised critical infrastructure in countries around the world. 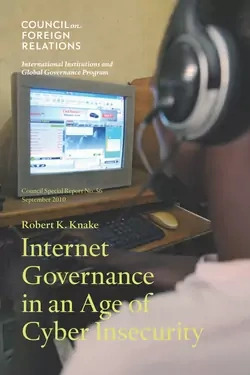 While no fewer than six UN bodies and multiple regional and national forums have sought to build a consensus on the future of Internet governance, there has been little progress thus far. The United States has largely abstained from these discussions, instead focusing on developing its own offensive and defensive cybersecurity capabilities while entrusting the ongoing stability of the system to the expertise of the private sector. In this Council Special Report, Robert K. Knake briefly examines the technological decisions that have enabled both the Internet's spectacular success and its troubling vulnerability to attack. Arguing that the United States can no longer cede the initiative on cyber issues to countries that do not share its interests, he outlines an agenda that the United States can pursue in concert with its allies on the international stage. This agenda, addressing cyber warfare, cyber crime, and state-sponsored espionage, should, he writes, be pursued through both technological and legal means. He urges first that the United States empower experts to confront the fundamental security issues at the heart of the Internet's design. Then he sketches the legal tools necessary to address both cyber crime and state-sponsored activities, including national prohibitions of cyber crime, multilateral mechanisms to prevent and prosecute cyberattacks, and peacetime norms protecting critical civilian systems, before describing the bureaucratic reforms the United States should make to implement effectively these changes. Internet Governance in an Age of Cyber Insecurity is a timely contribution on an issue increasingly capturing the attention of policymakers. It presents technical ideas to the nonexpert in accessible and compelling language. The report leaves little doubt about the importance of cybersecurity to the future of both the United States and the Internet itself, and its recommendations provide a strong foundation for future action.